Professor Isaac Adewole, Minister of Health, has appealed to the leadership of the Joint Health Staff Union (JOHESU) to prevail on their members to shelve their planned strike action. 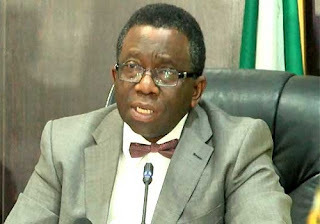 In a statement signed by Boade Akinola, Director, Media and Public Relations, Federal Ministry of Health (FMOH), Professor Adewole said government has continued its negotiation with the Union and hoped that issues in contention will be addressed through consensus. The Minister further urged them to consider the interest of Nigerians who are the ultimate victims of the strike action. The Minister assured the JOHESU Leadership of the commitment of President Muhammadu Buhari to the wellbeing of all Nigerians, including the welfare of stakeholders in the health sector. It will be recalled that the health workers under the auspices of JOHESU and the National Association of Allied Health Professionals (NUAHP), recently vowed to embark on an indefinite nationwide strike should government fail to meet their demands by 30th, September 2017. In a statement jointly signed by the National President, Dr. Obinna Ogbonna and its National General Secretary, Com. O.A Obisessan, the unions claimed that the ultimatum earlier issued to the government is expected to elapse on the 12th of September, 2017. The duo, who accused the Health and Labour ministries of conspiracy against the unions, declared that the unions were not considering resuming strike immediate due to mobilization factors and the need to give the Government further room to address their demands. “Come 30th September, 2017, if the Government refuses to meet our demands, the unions will have no other option than to shut down health care services nationwide”, the unions said. In their 23- point demands, the unions are demanding the revamping of infrastructure in the tertiary health institutions; implement the report of the inter-ministerial sub-committee on critical matters in the health sector as well as addressing issues such as professional autonomy. The Unions also want the government to address the issue of headship of departments/units in hospitals, enhanced entry point (EEP) for medical laboratory scientists and radiographers, non- payment of backlog of arrears, residency training for other health professionals, appointments of consultants and payment of specialist allowance, and post of surgeon general, among other issues.